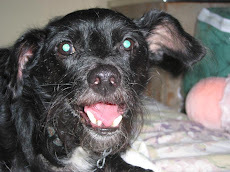 My dog says to remember that Halloween can be a scary and dangerous time for your family pets. Be sure to keep your cats and dogs inside so they don't fall victim to pranks or theft. Also be careful your companion animals don't dart out the door if you're staying home to greet Trick-or-Treaters; all the activity at the front door allows for a quick escape. Put your animals in the bedroom or den for the evening, give them a nice soft bed and some treats, and shut the door until everyone is settled in for the night. Lastly, remember that all the costumes and masks can be frightening to animals, especially dogs. Faces are covered, people's outfits may make them appear larger or taller, and gestures may be more animated than usual. Even these slight changes can spook your animal or cause them to not recognize you. 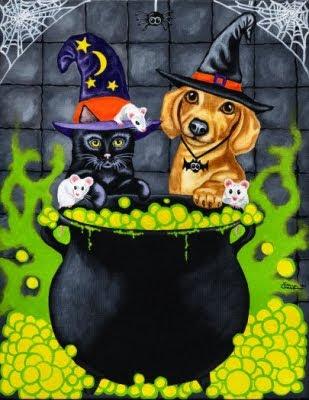 Halloween is fun for humans, but be sure it's a stress free day for your companion animals. Happy Halloween! My poor Chihuahua didn't know who I was this morning. Poor little thing. I agree with this posting. Thanks for the reminder! Yes, it's something people usually don't think about. But us dogs can get really freaked out when our parents wear costumes. One time a neighbor dressed up like the dog catcher. Now, THAT was a scary costume! Happy Halloween to you and Titina. Woof!